Mesopotamia (from Greek “between rivers”) often referred as the cradle of civilization was situated between the rivers Euphrates and Tigris what is today’s Iraq, eastern Syria and southeastern Turkey. History of Mesopotamia starts with the emergence of the Sumerians whose origin is not exactly known about 3100 BC. Besides irrigation which was crucial for emergence of all early civilizations, rise of the first civilization in the Middle East can be also attributed to trade. The Mesopotamians had to import large amounts of wood, building stone and metals because of lack of natural resources. In contrary to Egypt which was geographically relatively isolated, the territory of Mesopotamia was much more open what resulted in frequent invasions and conquests of nearby Semites. 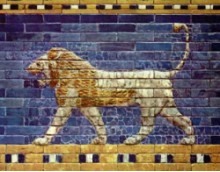 They established their own civilizations and empires under influence of highly developed Mesopotamian civilization. There are several different chronologies of history of Mesopotamia which can be very confusing to an average reader. To make history of Mesopotamia more clear our team decided to use chronology which distinguishes periods in southern and northern Mesopotamia, and Asia Minor.